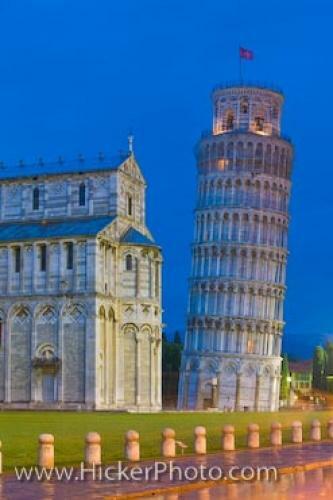 The Leaning Tower of Pisa is lit up at dusk in the town of Pisa in the Tuscany, Italy. Beside the famous Italian monument is the Pisa Duomo and both are located in the Piazza del Duomo (Campo dei Miracoli), which is a UNESCO World Heritage Site. The Leaning Tower of Pisa stands tall and silent beside the Pisa Duomo at dusk in the Piazza del Duomo in the town of Pisa, in the Region of Tuscany, Italy. The Leaning Tower of Pisa is one of the most recognized buildings in the world and has long been a source of mystery as to why it stays standing when it is leaning over so much. Millions of people come to this site every year and if they are adventurous enough they can climb all the way to the top and look out over the Campo dei Miracoli. By day the grounds of the Piazza are full of people posing for a photo of themselves holding up the tower or pushing it over. Duomo at dusk in the Tuscany, Italy. ... by Bonanno Pisano, but due to poor foundations and possibly soft ground, by the time he reached the third storey the building was already sinking into the ground. He stopped work and it stayed unfinished for almost 100 years before Giovanni di Simone and Tommano Simone finished it in the 14th century. The Pisa Duomo, which means a cathedral church, is the main part of the church while the Leaning Tower is the bell-tower. It is dedicated to Santa Maria Assunta and is believed to date back to about 1064. Part of the original building was destroyed by a fire in 1595 and it had to undergo renovations to restore it to its former glory. The famous leaning tower of Pisa and the Pisa Duomo at dusk in Piazza del Duomo (Campo dei Miracoli), a UNESCO World Heritage Site, City of Pisa, Province of Pisa, Region of Tuscany, Italy, Europe. I photographed this photo with the digital SLR camera model Canon EOS-1Ds Mark III, aperture of f/8.0, exposure time of 13/1 sec. on ISO 50, as always I used a original Canon Lens, the focus lenght for this picture was 70mm.